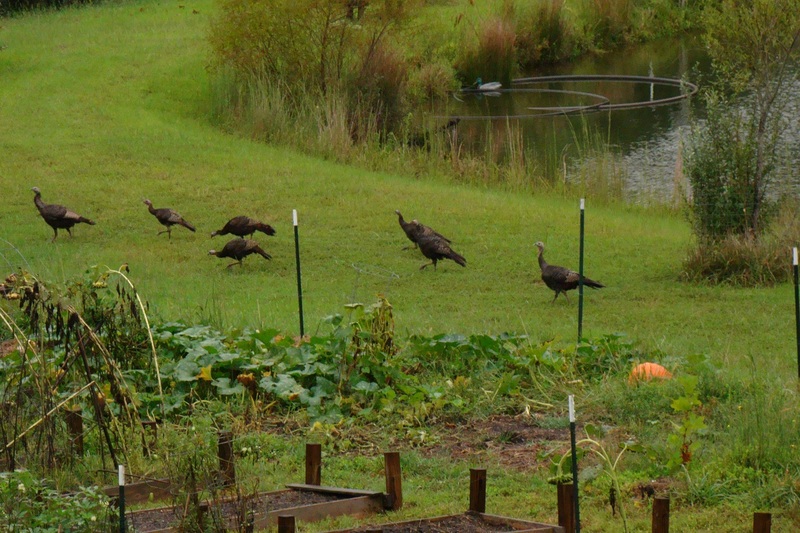 Turkeys have been hanging out in our yard for the past few weeks, quite a large bunch of them. Maybe they’re impressed by our giant pumpkin? They are hardly bothered when we’re around. I’ve tried fussing at them to see what they do and it’s mostly stare at us. Like the deer who sleep in our front yard do. We get no respect from our local wildlife! 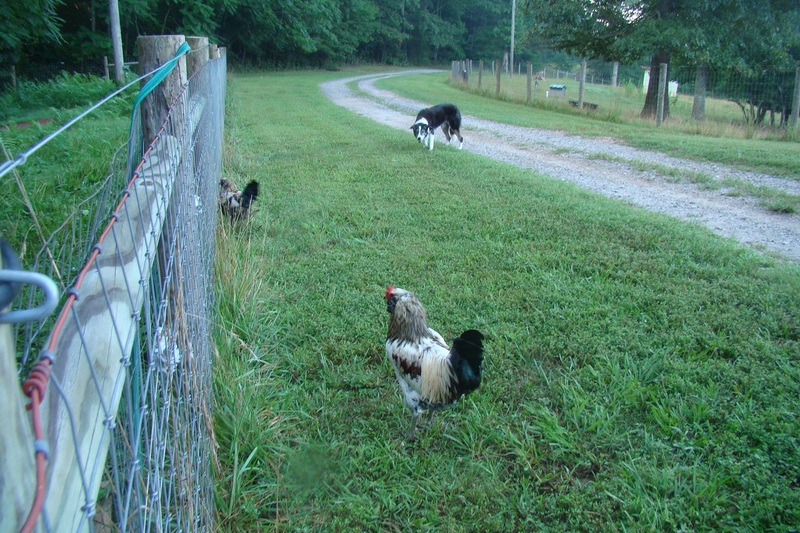 Roosters got kicked out of our barn for injuring the hens and had been running amok for the past few months. We saw them hanging with a group of wild turkeys last week and they were heading down the driveway towards the house on Monday (a quarter mile from the barn). 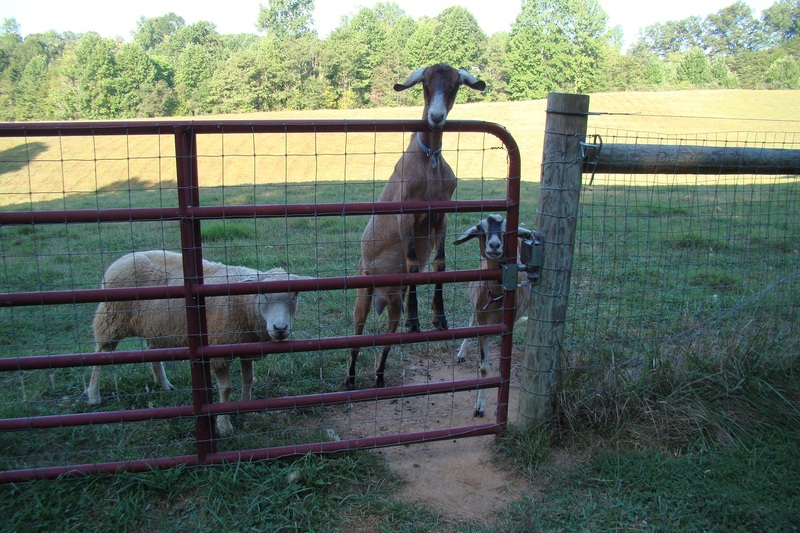 They had also started following me into the big pasture and that was a big mistake. We found them there this morning, our livestock guardian dogs had gotten them. Yes, chickens can fly. Maybe they didn’t see the dogs coming? Did the dogs do something bad? No, believe it or not large predatory birds can kill young livestock. Our neighbors lost a few baby goats this Spring to predatory birds. I guess Milos and FiFi don’t know the difference between chickens and chicken hawks. On the upside, my husband doesn’t have to build them their own shelter for the winter. On the downside, they made me laugh every day. And Jenna loved bringing them to me. Maybe we’ll get a few more next Spring. Our mushroom logs surprised us this week with a fresh crop, they’re popping out everywhere. These are shiitakes. We’ve got oyster mushroom logs, too, but they haven’t yet produced for us. I’m going to make mushroom risotto and lamb shanks for dinner tonight! Today is September 11th, the 10th anniversary of the 9/11 tragedy. My husband and I spent ten years in the volunteer fire service when we lived in NY’s Hudson Valley. We shared a Firefighter of the Year award from our fire company and also volunteered with IBM’s Emergency Control Brigade. That’s where we met and served with Paul Tegtmeier – a funny, caring guy. Someone you’d gladly partner with in an emergency. His lifelong dream was to be a NYC firefighter and he finally got hired on at age 40. Paul was on his way to work when he saw a plane hit one of the towers. It’s believed that he joined up with a crew without signing in just as they headed to the towers. His civilian shoes were found at the firehouse and his car was parked a few blocks away. It is believed he died in tower 2, but his body was never recovered. I can’t hear the words 9/11 without thinking of Paul. His bravery and sacrifice are not forgotten. 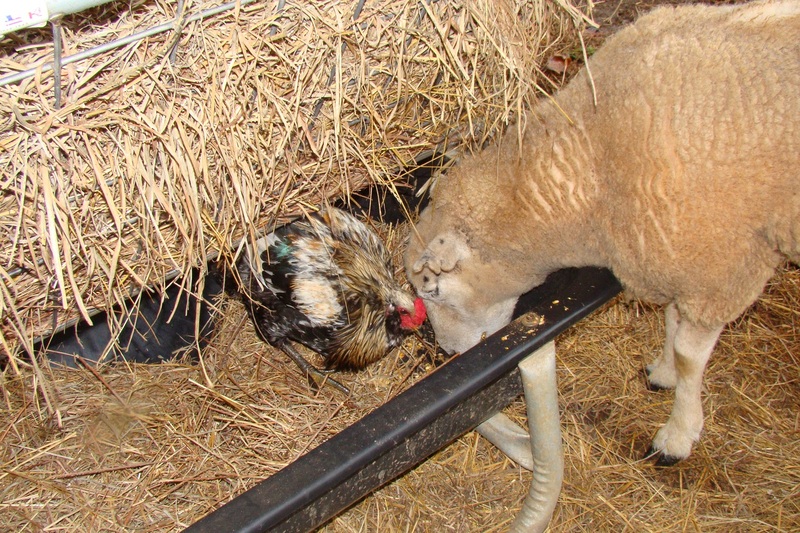 Houdini the rooster and Augusta the sheep share breakfast together. It’s actually sheep and goat grain, but contains lots of corn. Gus could easily toss her head to get rid of the chicken but seems perfectly content to share. That’s a good girl, Gus! Rudy’s happy that it’s breeding time again. He’s being all lovey dovey to anyone who will put up with him. Since his mating season grooming plan is to become as stinky and disgusting as possible (He likes to pee on his beard. Ick. ), I am not someone who puts up with him this time of year.